Sparring clip showing the last generation of the Pentti wasters. Unfortunately Pentti no longer produces these wasters so they can only be bought second hand, if you are lucky enough to find someone who is willing to part with his Pentti waster. However, the blade characteristics of these are so unique that I feel that it is vital to take a closer look at the Penttis before discussing the other synthetics on offer by other makers. UPDATE: PurpleHearts makes very fine copies of these called Pentti+ and I can highly recommend them, as they are near identical in design, and above all uses the same high-quality material, rolled Amid PA6. Admirably, Pentti has never settled with a single design. On the contrary, he has listened to the opinions and thoughts of the rest of the club and has constantly sought to improve his designs, ending with a 4th generation of his longsword design. Cleverly, this has obviously been studied well during the development of the Knightshop synthetic longswords and it continues to influence other makers as well, which is a good thing indeed. The first Pentti waster I had a chance to try was a straight longsword somewhat similar to that of the Spanish Like Steel nylon wasters, with very little tapering from cross to point. Having had no experience with any nylon wasters of other blade profiles I had little to compare with. However, it was clear that these could inflict some serious damage if not handled with care. They were quite rigid, with very little flex, which made them quite dangerous in the thrusts, while being point heavy enough to more or less regularly cause hand injuries of varying degrees. The second version I owned had a flared ricasso, similar to that of the PurpleHeart Synthetic Longsword II. However, the flared ricasso did little to help protect the hands due to the thick nylon blades. The flare was too small to actually catch these thick blades. In all other aspects it was still very much similar to the preceeding version. The third version I owned was a prototype for the current version, much thinner, clearly tapered both with regards to distal and profile tapering, and cut with a ridge which the last version lacks. This was a big step from the previous versions as I will try to expand on below. The final fourth version was identical to the third, but for manufacturing reasons, without the ridge. This new market version introduced a new design and a completely unique set of characteristics. As such Pentti has set a trend for a new standard in synthetic longswords, which is quite impressive for such a humble person as Pentti, a man very few actually know of outside of GHFS. What this new type of synthetic waster introduced was reasonably safe thrusting, something no synthetic waster had offered thus far and this changes things quite a lot. And as a positive side-effect; striking has become a little less dangerous as well. The flex was apparently designed to be most prominent in the last third of the blade, which makes it work reasonably well with techniques from the bind. It is not perfect, but this is very hard to achieve, even with steel. There may be some room for improvement here though, for any manufacturer that decides to pick up on working with this type of material. The cross was a simple steel bar, similar to that of the Like Steel wasters, which could be dangerous when thrust into an armpit or if you would fall upon it at a bad angle. However, the diameter exactly fit rubber arrow blunts which considerably lessened this problem. But, it doesn’t look very professional. The new steel crosses of the Knightshop wasters are clearly preferable, since they work like a real cross, but have balls at the ends to prevent injury. The pommel is a weak part in the Penttis. 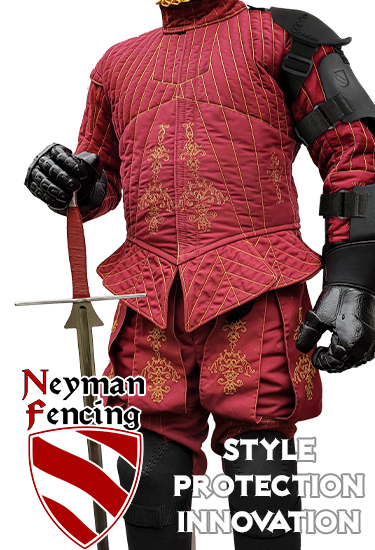 It is made of steel, which is good, but it has a straight edge at the back that can put dents into a fencing mask. Without filing them down a bit, they also put wear on the gloves. A rounded pommel would have been preferable. The handling is perhaps a little too light on the point, which is good for safety reasons, but often also gives a strike-focused fencing with too little use of the thrust. This needs to be countered with discipline. The material in all versions of the blades was outstanding and it became apparent with the final, strongly tapered version. It is still by far the best I have seen. It is called AMID PA6 and I strongly recommend all manufacturers to look into using the same material or a material with very similar characteristics! The simple reason for this recommendation is that it is the only material that I have seen thus far that can be shaped into a blade that can offer good flex and still return to “true”, without becoming bent with use, a problem which is much to common with the tapered synthetic simulators. Problems with returning to “true” is of course less apparent with rigid wasters that have little flex, but on the other hand, they have other disadvantages with regards to safety. As for the looks of the Penttis, they clearly have a “home made” look to them and do not look as professional as we need our tools to be. The level of “finish” has been enough thus far, but for the future, at least in my opinion, we need a sword with a considerably better finish if we are to be able to establish ourselves properly amongst other martial arts communities. It should also be noted that these wasters do not work well with heavier or much more rigid wasters like those of Like Steel or PurpleHeart. This becomes especially apparent with the Krumphau, but other Versetzen can also be somewhat problematic. Of course this is true of all sparring weapons; They work best against weapons of a similar design.